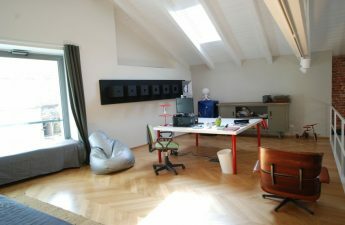 If you have a house from the very beginning of the 20th century,an area like one small room in a modern apartment, the only advantage of which is the location in the city center, then it’s almost impossible to create a comfortable place to stay with a bathroom, a cooking room and a bedroom. But the real masters all under force. Such is the Italian Silvana Citterio, who easily coped with the tasks. It is interesting that after the realization of all his ideas, the apartment did not become closer and squeezed. Everything looks quite harmonious and cozy. A few meters away I managed to place a bathroom with a shower, toilet and sink. The remaining space is reserved for other zones. On the wall made a small balcony with a window opening. 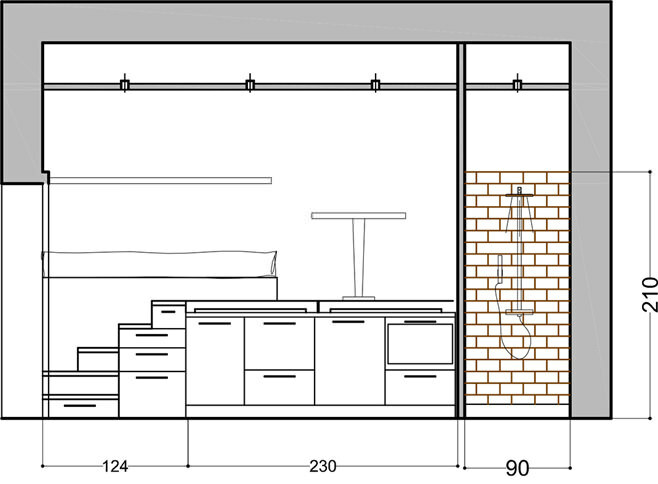 Since the apartment has rather high ceilings, it turned out to create two levels, each of which is divided into zones. On the first level there is a bathroom, a corridor and steps to the second tier. 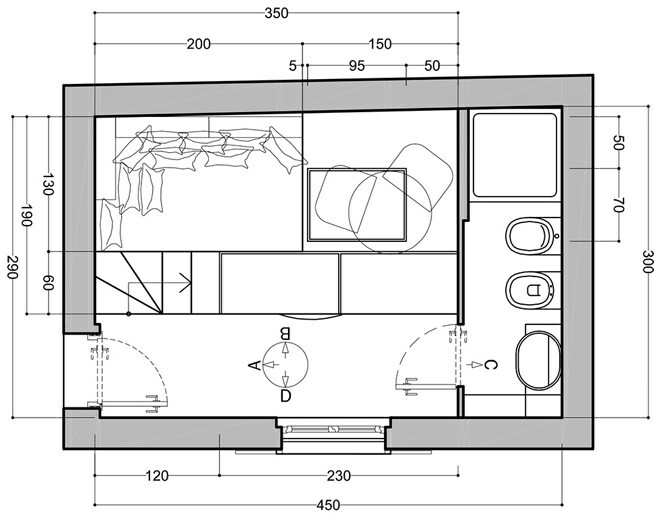 The second floor placed a spacious bed and a small table. The unoccupied height on the top floor is just one meter from the floor surface. 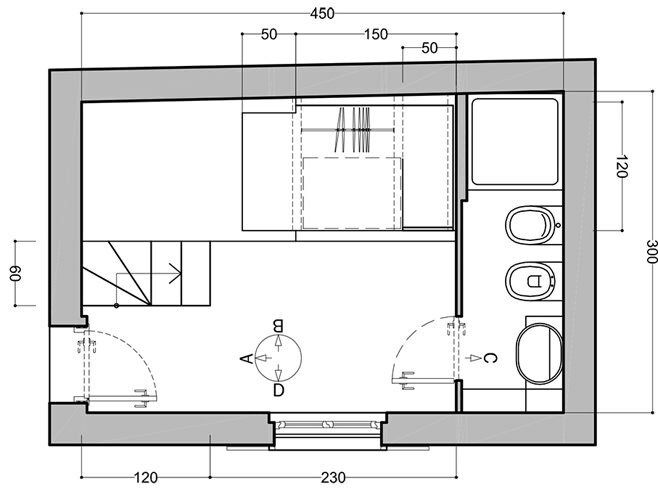 The kitchen space is located along the bathroom in the direction of the entrance door. 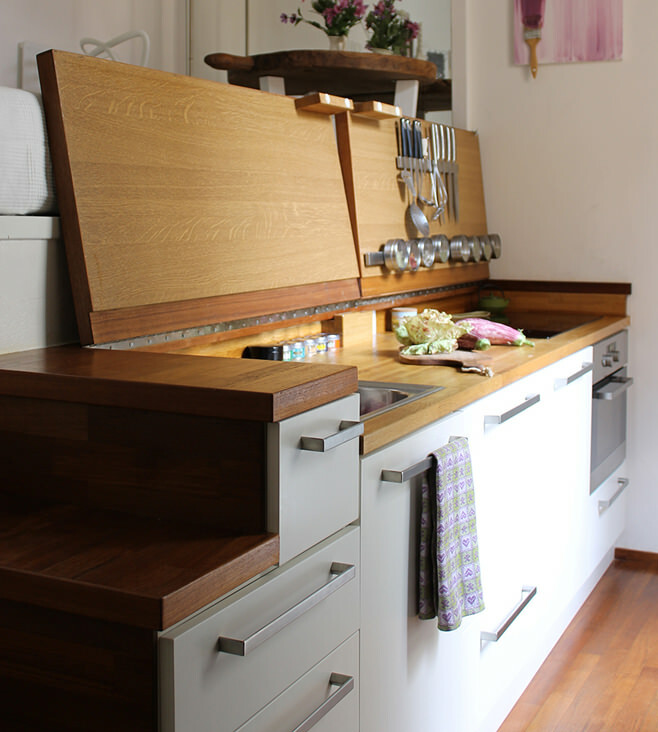 All appliances are built-in, drawers are pulled out, which saves space. 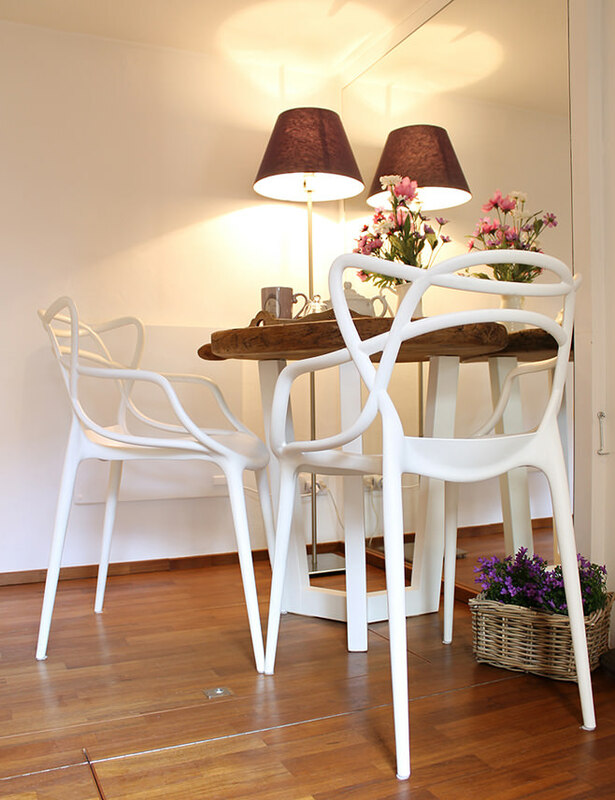 Directly above the kitchen is a coffee table and chairs. 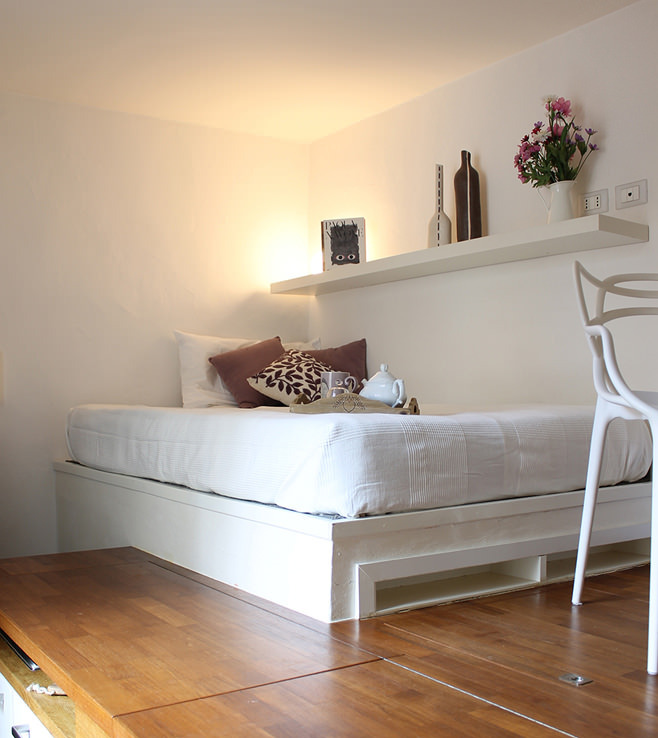 The bed is next to it, and a shelf is installed a little higher, on which you can arrange photos and a night lamp. Near the table hangs a large mirror, which reflects the bed, which allows you to visually expand the space. 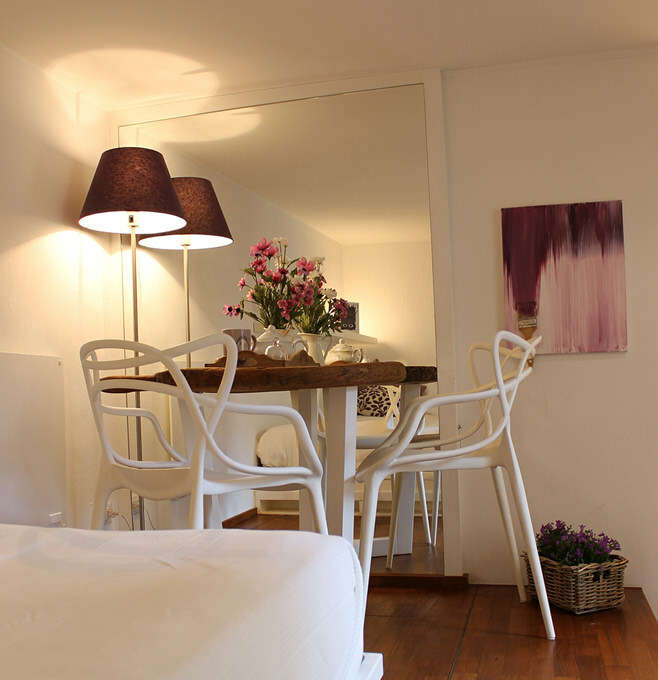 Mirrors are always beneficial to use if you need to visually enlarge the apartment. 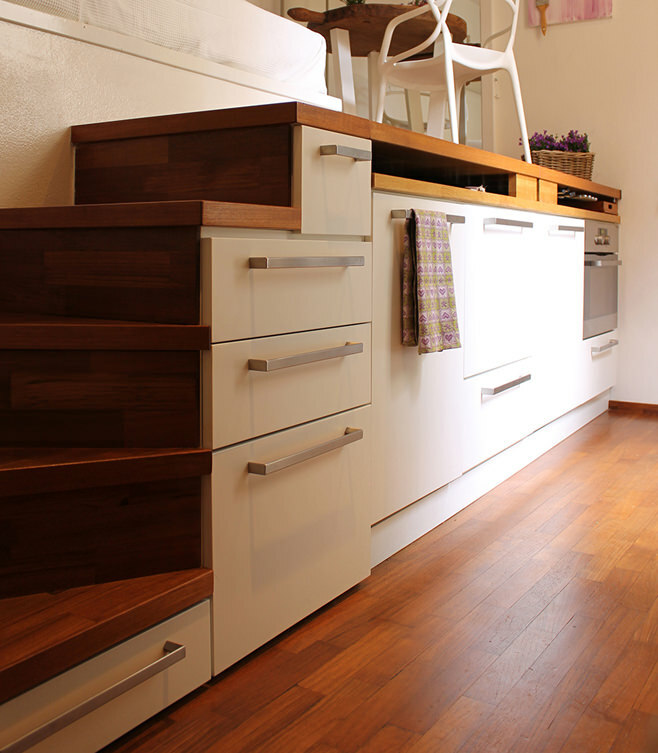 Steps leading to the second tier, perform moreand the role of kitchen furniture. 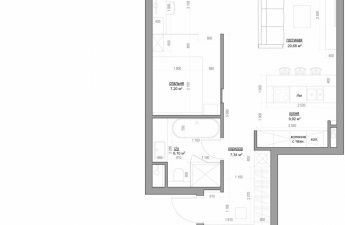 The floor in some places on the second level reclines and provides the opportunity to use the sink, stove or table in the kitchen. On the reverse side, with the help of magnets, containers for spices are attached. Agree, it is quite convenient, especially in such limited space. To the naked eye, you can see that the designer did his best to make the apartment cozy and comfortable. Even adapted for storage. Every inch in the apartment is used with benefit. 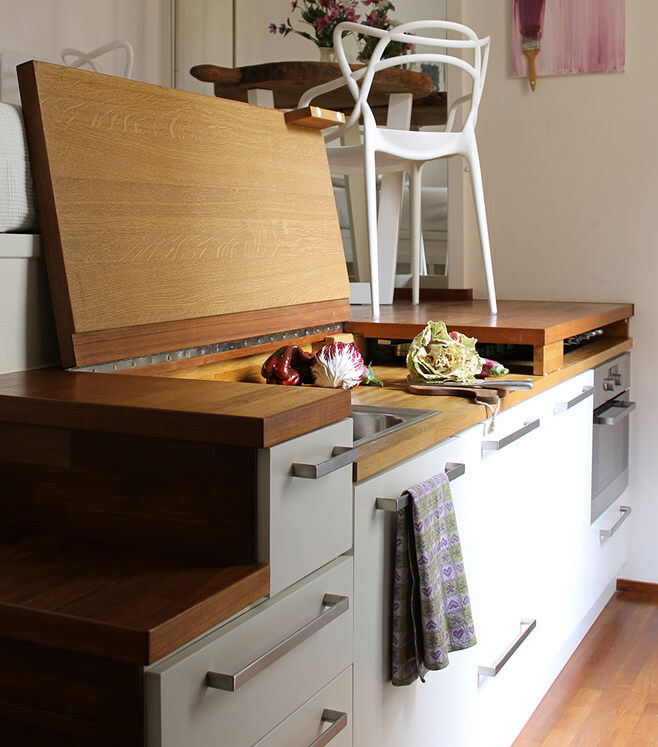 You can fold not only part of the kitchen, but also the floor on the upper tier. Wardrobe hid under a secret hatch. It can go down the stairs. 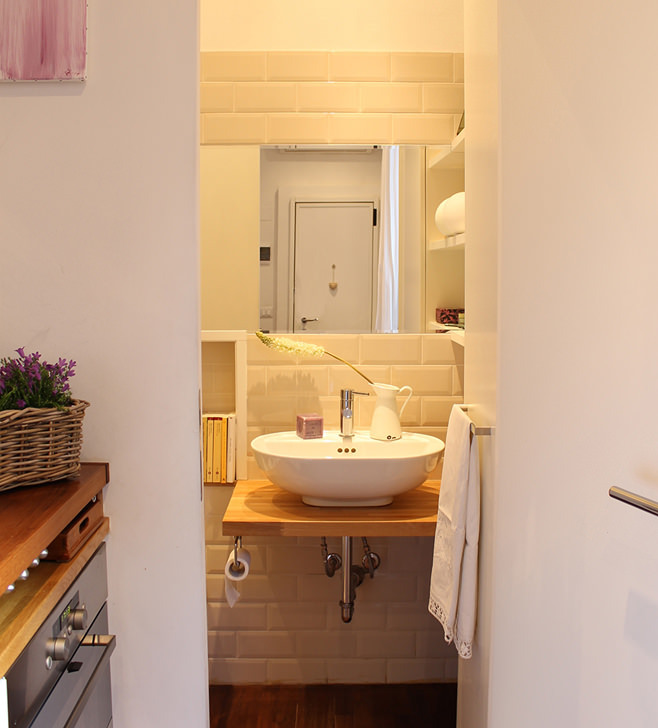 The surface finish of the walls in the bathroom is made withusing white ceramic tiles imitating brickwork. 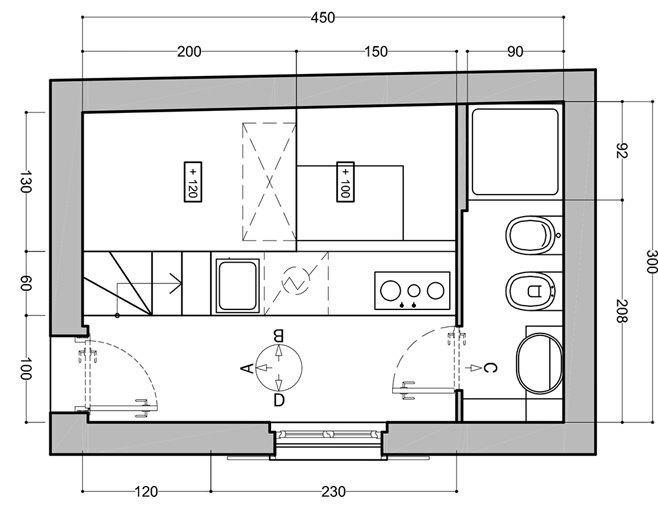 The bathroom occupies enough space in the total area of ​​the apartment, but everything is organized in such a way that its size does not affect the level of comfort. 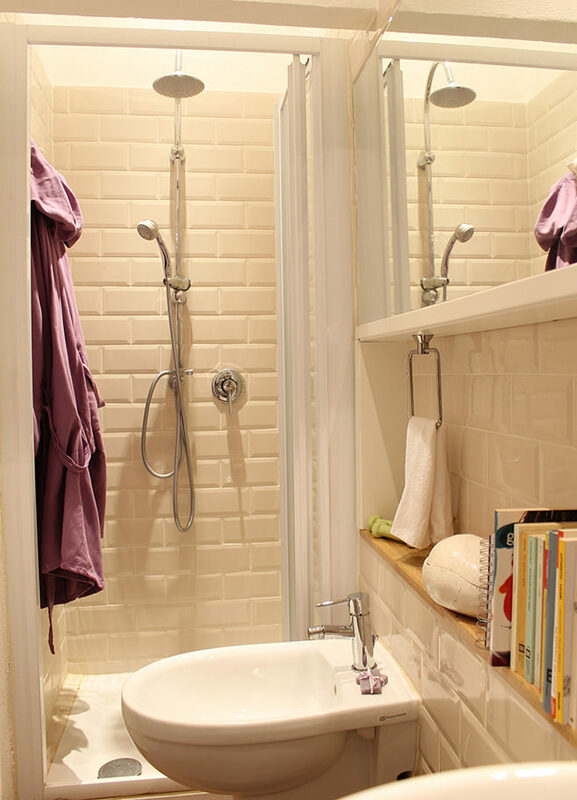 All plumbing is conveniently located, a wall cabinet is used for bath accessories.